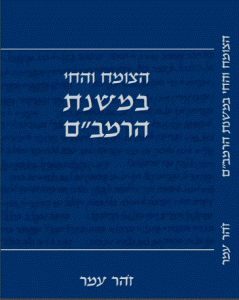 Several studies have been devoted to the work of Rabbeinu Moshe Ben Maimon (the Rambam or Maimonides), one of the greatest halachic and science thinkers and philosophers of the Jewish people of all times. In terms of his biography, Maimonides’s career in medical science has been studied, from his professional training to his serving as a court physician in the Ayyubid kingdom. The great influence of medical science is already evident in his commentary on the Mishnah and in the chapter on Hilchot Deot, chapter 4, in the Mishneh Torah. As part of this research, we published a commentary on this chapter by the Italian physician R. Jacob Zahalon. This, of course, is in addition to his medical treatises. In a collaborative study with Dr. Yaron Seri, a new edition of “Samei ha-Mavet” [lethal drugs] a modern Hebrew translation of the original in Arabic, will be published soon, which includes extensive introductions and explanatory notes on the text. In the framework of our research, we have dealt extensively with Maimonides’s method of identifying the incense spices, the five kinds of maror [bitter herbs] which a person may use to perform his obligation on Pesach, an explanation of the oils and the wicks mentioned in the chapter Bamah Madelikin in tractate Shabbat, the color of tekhelet and argaman, etc. 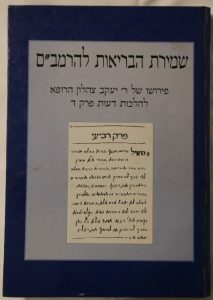 The highlight is a systematic study of the explanation of the plants and animals addressed in Maimonides’s commentary on the Mishnah, published by the Institute of Torah and the Land, which was received with great respect among scholars and the Torah world and was awarded the Rav Kook Prize.